When I think of a farmhouse kitchen, an apron sink is what first comes to mind. Usually a white apron sink. But when I got my kitchen cabinets made, we were on a tight budget and our cabinet guy said it would cost a ton more money for him to cut down the cabinet to make it work for an apron sink. And he said the sink itself cost a lot more. That’s one of several things I wish I would have researched a bit more on my own or talked him into doing. Because I love apron-front sinks. . . Although, I’m happy with what I went with because although I’m super in love with farmhouse style, I think it could date my kitchen. Like in 20 years, people will look at an apron sink and be like, “Wow! That kitchen is so from the 20 teens!” Is the 20 teens even a thing? Plus, I’ve had a porcelain sink before and I hated it. I felt like I spent my life cleaning up marks on it. But a girl can dream, right? 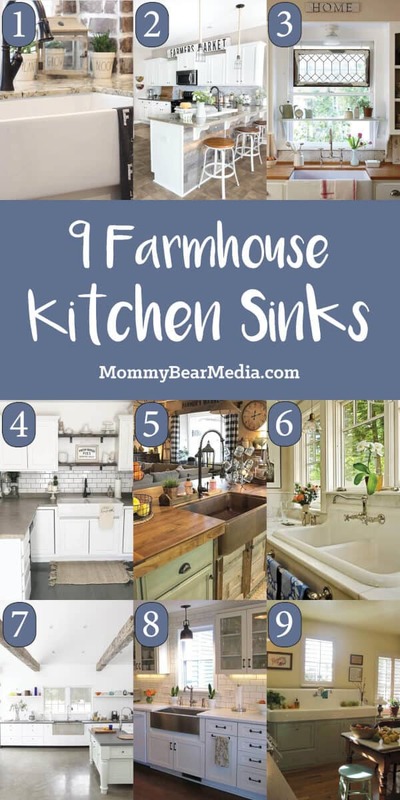 Here are some farmhouse kitchen sinks I love. Maybe someday I will have one like these. But I really like the towel, which reminds me that really I should be accessorizing with farmhouse decor so I can get that feel but keep my affordable sink. I think the faucet pulls everything together nicely too. Oh, And I love the plant pots too. If you read the full post, there are better shots of just the sink, but I like this shot to show how the sink fits in with the whole theme and isn’t the only farmhouse thing in the kitchen. Her post also lists where she got most of the stuff, which could be very helpful. She got her sink at IKEA, which I’ve heard several other people say they got theirs there too. Apparently, I should have gone there, although her sink isn’t near deep enough for me and has two separate sides, which I hate. and it’s a really good place to put cute things, like plants, without having them on the counter (I hate things on the counter). Plus, I love the old window hanging in the window. Too bad my shutters would get in the way of both of those things. It’s personally way too much white for me, but she did a good job pulling it all together. Plus, the doors under the sink bring in some of the rustic barn wood, without having to do all the cabinets with barn wood. I like the fruit basket and the glasses holder thing. Plus, somehow you can click on some of the things in the photo on Instagram and it tells you where to buy them. The wall of windows isn’t bad either. And let me just say that the towel bar in front of the sink sounds like a good idea, but I know I would hit it like 5,000 times. I really like the polished concrete floor. I wonder if I could do that to existing concrete on my back porch that some day I want to be my sun room. If I would have actually researched sinks before I bought mine, I’m pretty sure I would have picked one like this. Oh well. I still like mine. Plus, the washboards on the side are practical and look cool. Plus, she’s hiding two dishwashers under the sink! « 25 Stunning Photos of Places to Visit Surrounding Boston, Massachusetts U. S. A.